Properly speaking, the Sargasso Sea covers every submerged part of Atlantis. Certain authors have even held that the many weeds strewn over this sea were torn loose from the prairies of that ancient continent. But it's more likely that these grasses, algae, and fucus plants were carried off from the beaches of Europe and America, then taken as far as this zone by the Gulf Stream. This is one of the reasons why Christopher Columbus assumed the existence of a New World. 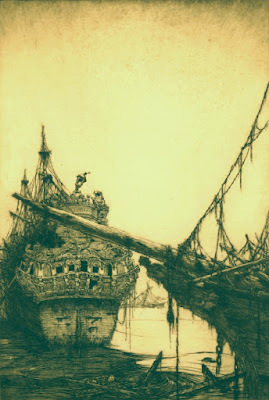 When the ships of that bold investigator arrived in the Sargasso Sea, they had great difficulty navigating in the midst of these weeds, which, much to their crews' dismay, slowed them down to a halt; and they wasted three long weeks crossing this sector. Such was the region our Nautilus was visiting just then: a genuine prairie, a tightly woven carpet of algae, gulfweed, and bladder wrack so dense and compact a craft's stempost couldn't tear through it without difficulty. 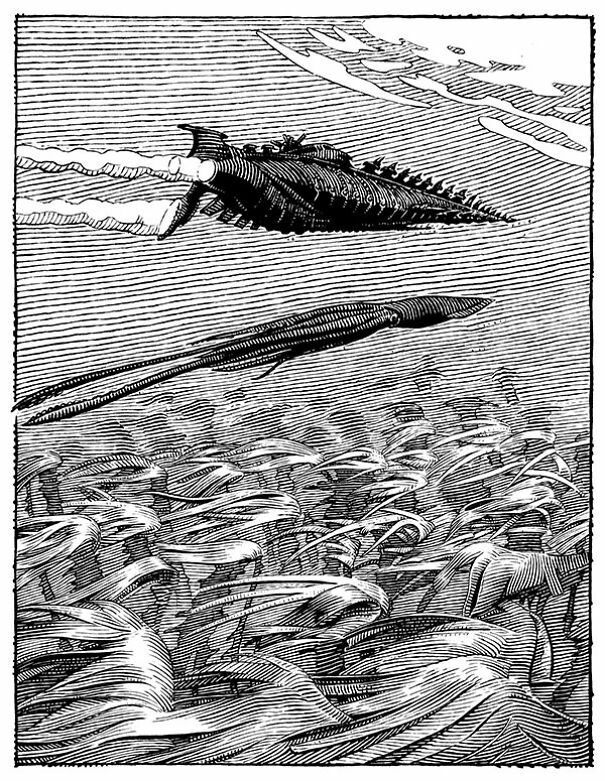 Accordingly, not wanting to entangle his propeller in this weed–choked mass, Captain Nemo stayed at a depth some meters below the surface of the waves. The first cycle is one that appeals the most to my fears: the Sargasso Sea Stories. Up to the early 20th Century, the Sargasso Sea was a place imbued with great menace and mystery: a great expanse in the centre of the North Atlantic Ocean Gyre where uncannily still waters and vast stretches of dense Sargasso seaweed conspire to entrap any vessel brave or foolish enough to encroach. 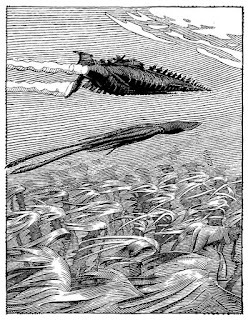 That combination of treacherous waters and the hint of unknown horrors made the Sargasso Sea a tantalising subject for adventure and supernatural fiction alike: Verne's seminal Twenty Thousand Leagues Under The Sea even spends a chapter in that strange realm. 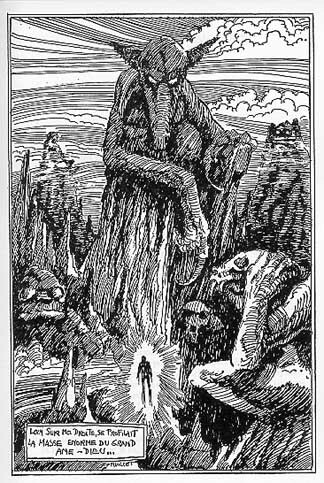 Dennis Wheatley's novel Uncharted Seas was later adapted into the curious Hammer adventure The Lost Continent (not to be confused with 1951's Lost Continent, or indeed C. J. Cutcliffe Hyne's Atlantean epic The Lost Continent), which featured a number of scenes and creatures that would be familiar to Hodgson readers. Hodgson's first published novel, The Boats of the 'Glen Carrig,' featured the unco waters in a starring role. The marvellous weirdness of the setting - a floating continent built on ravenous seaweed and the flotsam and jetsam of the ages - is a Lost World unlike any other, and all the more memorable for that. It combines the sense of danger in an unknown landscape of Haggard or Burroughs with the oppressive tension of castaway stories - and though the climate is decidedly different, there's a little of the mounting dread of the ice-trapped ship which informed Dan Simmons' The Terror, the horror-drenched retelling of the ill-fated Franklin Expedition coming to terrorise the small screen soon. Likewise, Hodgson's work informed such modern cinematic masters as John Carpenter (whose The Fog is surely the most Hodgsonian film yet made, at least this side of Matango) and Guillermo Del Toro, who personally ranks him among his favourite authors. 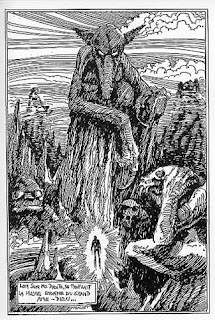 The second cycle is composed of the Chronicles of Carnacki the Ghost-Finder. What was most thrilling about the Carnacki stories was the sense that you didn't know exactly what to expect: while Seabury Quinn's Jules de Grandin tended to go for the Scooby-Doo revelation for the supernatural mystery, the Carnacki stories zig-zagged between hoax and real supernatural menace. Of course, me being me, unless the explanation is particularly novel - The Phantom of the Opera being "just" a disfigured mad genius, or the Hound of the Baskervilles being "only" a rabid phosphorous-maddened dog - I tend to greatly prefer a supernatural explanation. 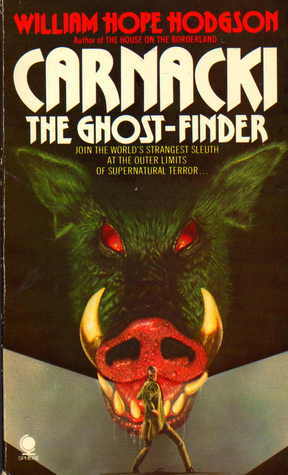 Perhaps my favourite of the Carnacki yarns is one of the most famous: "The Hog." In the hands of Smith, Lofton, Milne, Nesbit, and Alexander, pigs are nothing short of delightful figures of whimsy and charm - but when transported to a horror setting, pigs become decidedly monstrous. It is because of this particular story I would place Hodgson's most famous novel, the H.P. Lovecraft approved The House on the Borderland, squarely in the Carnacki Cycle. 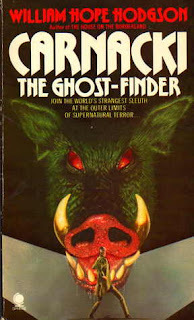 I'm sure some would disagree (the absense of Mr Carnacki himself in the novel being a particular issue), but the shared elements of swine-things, interdimensional transportation, and the curious name Berreggnog convince me of a certain synchronicity between not only Carnacki and the damned House, but of the third cycle. It wouldn't be a Blog That Time Forgot Post on Classic Weird Fiction without the magnificent macabre of Stephen Fabian! In all literature, there are few works so sheerly remarkable, so purely creative, as The Night Land. Whatever faults this book may possess, however inordinate its length may seem, it impresses the reader as being the ultimate saga of a perishing cosmos, the last epic of a world beleaguered by eternal night and by the unvisageable spawn of darkness. Only a great poet could have conceived and written this story; and it is perhaps not illegitimate to wonder how much of actual prophecy may have been mingled with the poesy. - R. Alain Everts, Some Facts in the Case of William Hope Hodgson: Master of Fantasy, 1987. There is a memorial to those who died in that conflict in my town. There are 53 names on the plaque. While I'm unsure exactly where or how some of them died, I found that a few died in the same month in April - possibly at the 22-day Battle of the Lys, or one of the other hellscapes that blights the lands of France to this day. Born Stratford-on-Avon, resided Gourock, enlisted Glasgow. SON OF ARCHIBALD AND MARY TURNBULL LAMONT; HUSBAND OF MARY BRYCE LAMONT, OF THORNBANK, GOUROCK, RENFREWSHIRE. Buried at ROYAL IRISH RIFLES GRAVEYARD, LAVENTIE, France. Grave Reference III. C. 7. SON OF JAMES AND ELIZABETH KEAYS. BORN AT GLASGOW. Died of tetanus. HUSBAND OF ANNIE KEAYS, 3 ANDERSON PLACE, TARBET Street, GOUROCK, RENFREWSHIRE. Buried at Amara War Cemetery, Iraq. Grave Reference IV. C. 1. Awarded the Military Medal (MM) and the Meritorious Service Medal (MSM). During a course of instruction in live grenade throwing, a N.C.O. threw a live Mells bomb which lodged in the parapet of the bench just above his head. L/cpl Holborn pushed the man aside & grasping the bomb threw it over the parapet. Thus averting a most serious accident & probably saving several lives. Deed performed at Bordon. 23rd July 1916. Buried BAILLEUL COMMUNAL Cemetery Extension, France. Grave Reference Sp. Mem. B. 2. Mrs Wallace Boyd, residing at 7 Willison's Lane, has been officially notified that her husband, Private Wallace Boyd of Machine Gun Corps, was killed in action on the Western Front on 11th April. 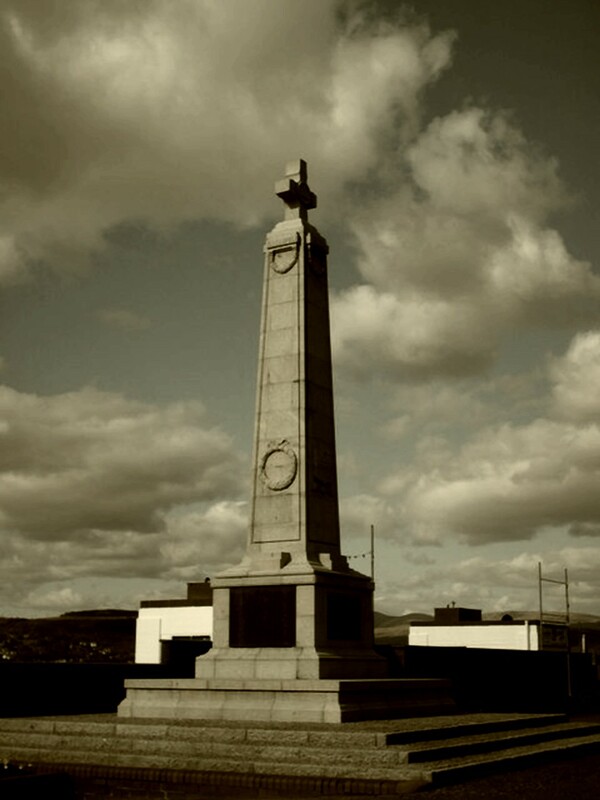 He formerly belonged to Gourock, and was employed in the Torpedo Factory. He is the second of four brothers with the colours to make the supreme sacrifice, the other brother being killed one year ago. He was 25 years of age, and leaves a widow with two children, one aged 2 years and the other only 6 weeks old. BOYD.-In memory of my dear husband, Pte. Wallace Boyd, M.G.O., killed in action on 11th April, 1918. My heart for you will ever pine. Inserted by his Widow and two Children, 2 John Wood Street. BOYD.-In loving memory of Pte. 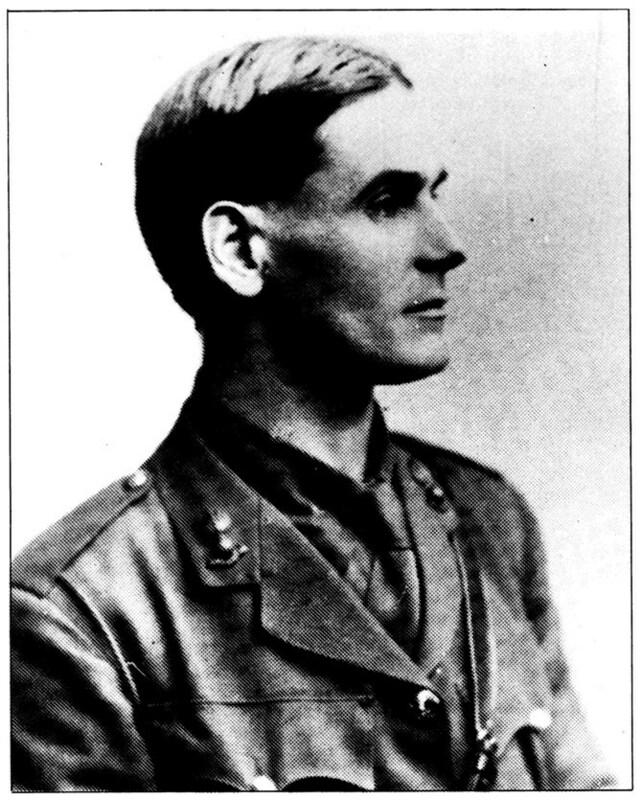 W. Boyd, who was killed in action on 12th April, 1918. And then some day will understand. Inserted by his aunt and uncle, Mr and Mrs Ed. Boyle, 7 Willison's Lane. BOYD.-In loving memory of Pte. W. Boyd, who was killed in action in France, 12th April, 1918. But what we think of him. Inserted by his aunt and uncle, Mr and Mrs A. Laing, 7 Gillespie's Lane. One wonders how a work of fiction, even as potent as the tales he wrote, could possibly compare to the merciless reality of this planet. 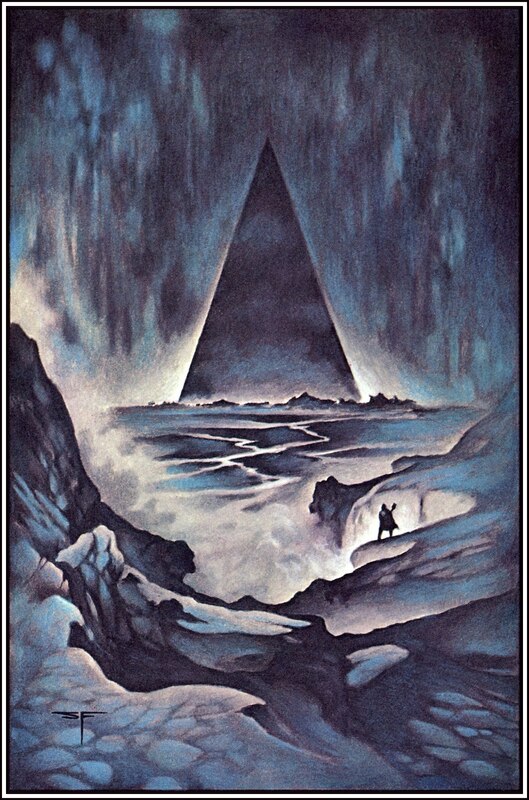 - William Hope Hodgson, letter to his mother, (courtesy of Sam Moskowitz) Out of the Storm: Uncollected Fantasies by William Hope Hodgson, Donald M. Grant, 1973.